I think I am going to fill these fun little coffins full of candy corn and use them as party favors. I cut them out with two different patterned papers from Fancy Pants Designs and then inked them up a little bit. The scroll sign was also cut with my Cricut and the Artiste cartridge and then stamped with the Treats for my Sweet stamp set. I added some crinkle seam binding ribbon that I dyed myself with some Plain Jane mist from Tattered Angels. I added a little border of black pearls under the sentiment and then finished them off with a button and some bakers twine from The Twinery. Miss Emma is ALSO having a sale that is going on RIGHT NOW!! It will end on Sunday, Oct 21st @ midnight! Use the code SPOOKY and start shopping here to get 20% off your order! 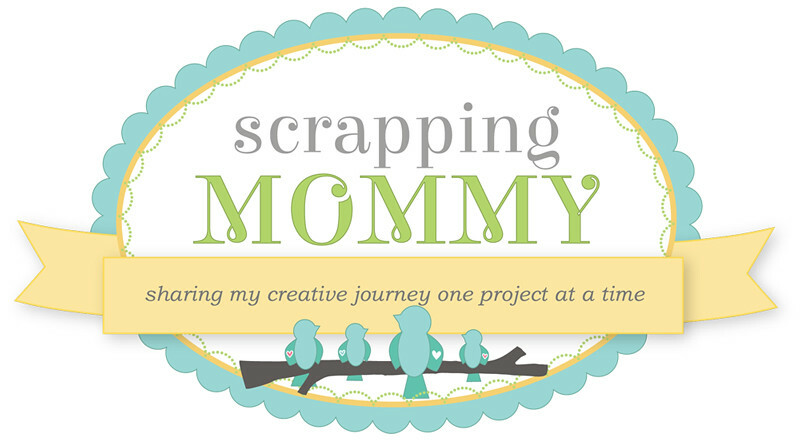 I am linking my project up at Ribbon Carousel RCC73 - Halloween Spirit and Paper Issues Halloween Harvest Time. OH MY...!! These are amazing,Amy!! The seam binding ribbon is the perfect touch!! Love those coffins!! I got the cart a few weeks ago, but not much time to play. I am going to have to make one of these for my hubby, he would love it!! Way tooooo cute!!! 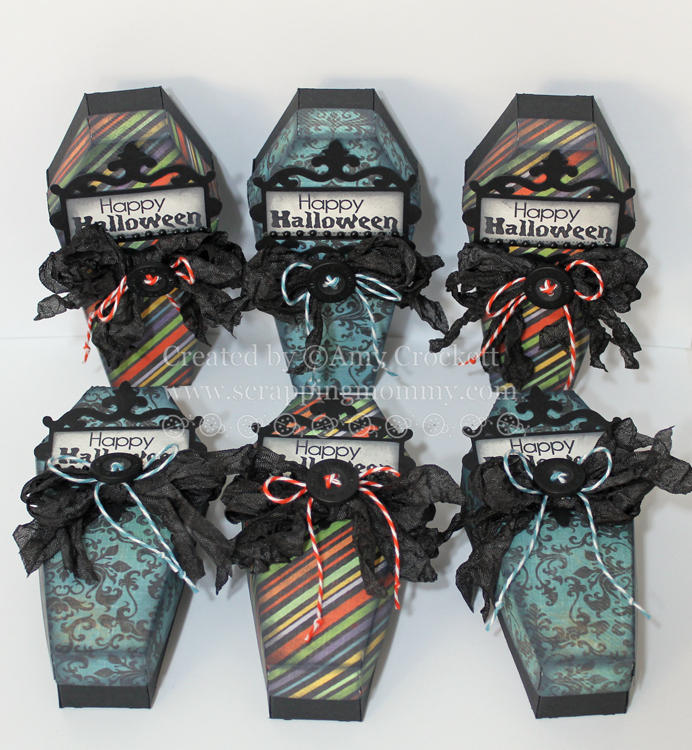 I love these little coffins...great gift filled with treats! These are absolutely amazing - love them! i really need to get me some of that seam binding!!!! your turqoise and black one is sooo pretty! love it! Can' get enough of those cute coffins. That doesn't even sound right does it? Very pretty! LOVE your coffins. The colors are wonderful and love the bows! Great job. Wow, these are incredible! What a perfect idea for party favors. The details are awesome, that ribbon looks great as do the pearls! Thanks for some fabulous inspiration!!! Super cute. The papers are great. Love your coffins. The paper you used is perfect and the added touches of the scroll, twine & button, the crinkle ribbon and the stamp are all beautiful. These little coffins are adorable! 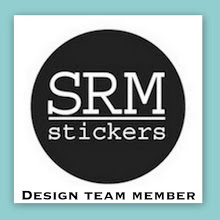 I need to get that Cricut cartridge! These little coffins are adorable ... 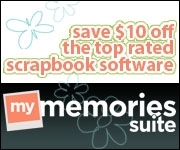 I need to get this Cricut cartridge! You all had me at halloween! Wow I am going to be in overload because I love them all!!! These are perfectly spooky! These are perfect for a Halloween Party!! These are awesome! I bet my kids would love these! very pretty coffins (that sounds funny) I love the paper you used!! I was just trying out the Artiste cartridge and the coffin cut today! Love your coffins. TFS. Amy ~ OMG!! How FABULOUS are these coffins!!! Eek!! Okay you know I LOVE the paper, how you did the ribbon and oh the stamp with that cut! UGH!!!! ADORABLE as always! I can't wait to get my invite to your party! LOL!!! AWESOME job as ALWAYS!!! Absolutely darling!! Love the paper you used! Adorable coffins! LOL so super cute. Beautiful treat coffin boxes! Love the paper used and sentiments! Awe, there so cute, I need to try to make one of these... Thanks for sharing, I'm a new follower !!! Too adorable! 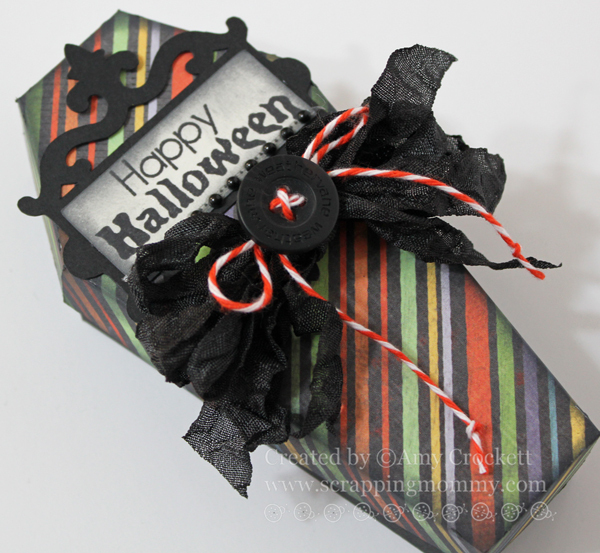 I love those little coffins and that crinkle ribbon and twine are fabulous! These are so fun! 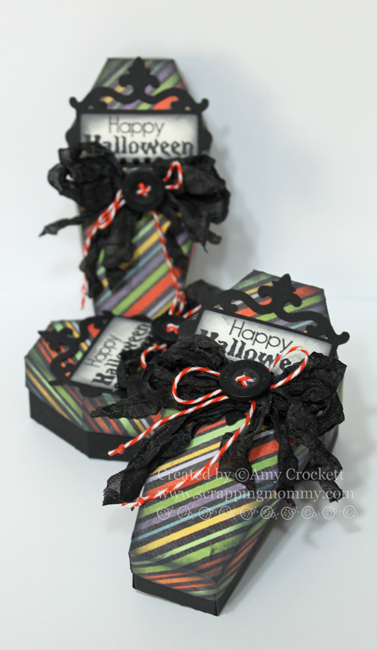 I love making Halloween projects... these are perfect! Your coffins are awesome. I just love them. Love the paper your chose too. I just bought some really cute halloween paper this weekend, so I guess I know what I'll be making. Thanks for the great -- I mean -- GREAT idea! What great coffins - they make such unique treat holders! Your coffin treat boxes are too adorable! Ooooh these are so pretty with the colors and embellishments. these are GORGEOUS! FABULOUS job Miss AMY! Love this project. How cute and a great idea. Your treat boxes turned out so cute. I like the way you did the sentiment holder...looks like iron gates. I also like how you did your twine on the button. Great job! Those are so cute!! I love the paper and the ribbon!! I'm making these for my co-workers. I have the bottoms done but not the tops. I was trying to figure out exactly what I wanted to do for the tops and seeing the printed papers really helps. I am having trouble getting them to actually fit inside of each other though. Every one that I've seen looks so much "smoother" than mine. LOL! These are simple goregous...love love love it!! These are adorable. I love all the prints you used and the way you did your tags. These are so spooky looking. Great idea for presenting a Halloween treat. 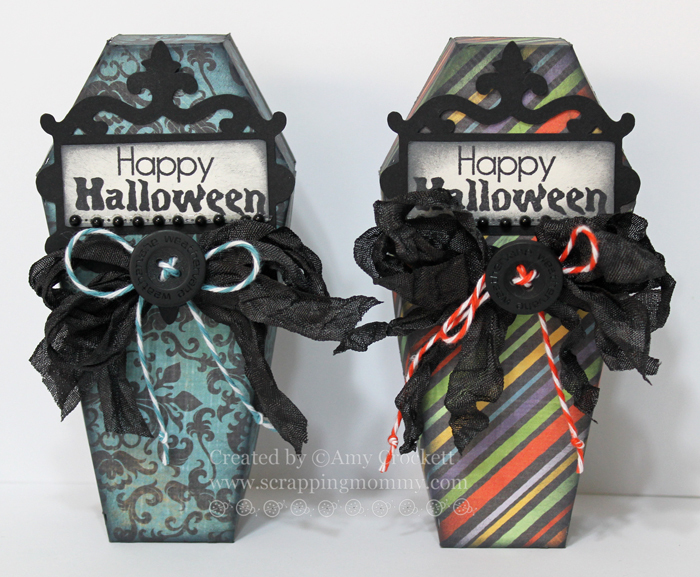 Adorable coffins :) love the patterned papers and the embellishments. I love these. The paper is perfect. I love the Artiste cart. These are awesome!!! I LOVE this idea..beautiful papers and beautifully decorated! Love the coffins - way too cute!! These coffin treat boxes are just too cute. Love the paper. 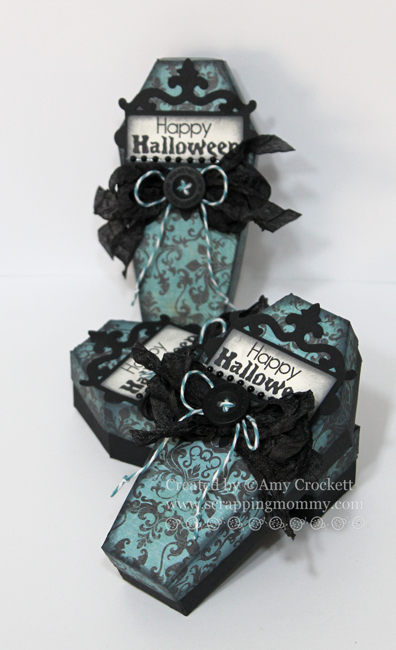 I love these little coffin treat boxes! Wow great coffins thanks for sharing!! great coffins, love your choice of papers. Love your idea. Thanks for sharing with us and also the chance to win the blog candy. These look awesome. I love the papers you used. Thanks for the chance to win. I love your paper! Wonderful projects! 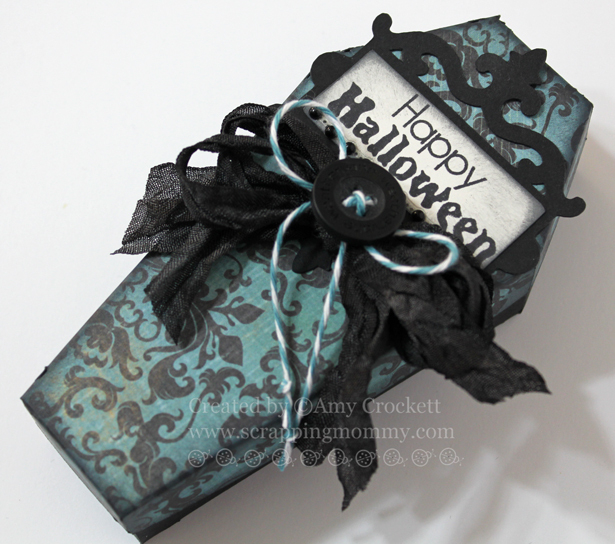 Love these coffin treat boxes!! Super cute coffins...love the papers used!! Great party favors--i like the paper you used. Wow...love these cool treat boxes. Such a great idea. Thanks for sharing. These are great treat boxes!! I might have to try making some of these. Beautiful treat boxes, great job! Love these coffin treat boxes. Such beautiful papers and love the ribbon. Very adorable! I love everything you have done with these little treat boxes! Your coffins are fantastic!! I LOVE LOVE the paper you used, and your inking is just perfect!! Love the coffins you made! Perfect Halloween party favors. Thanks for sharing your creative talent. Wow these coffins are soo cute love how you decorated them. Fun idea! TFS and for the chance to win. Super cute coffins! Thanks for sharing. Your Halloween treat coffins are so adorable!! These are gorgeously spooky, Amy! I love the papers you used and how you gave them such gorgeous embellishments! These coffins are so cute. Love the ribbon. Very cool! Love your paper choice and accents. Amy those coffins dare I say are elegant! Papers are bootiful too! Amy, muchas felicidades realizaste unos ataudes divinos!!! Very cool treat holders! tfs! Cute Treat boxes- may have to scraplift for my Grandsons. Really, really cute, Amy! I didn't know that the seam binding ribbon could be dyed. Very cool! Super cool treat holders. Love the colors and the ribbon is such a great finishing touch. Looks awesome. Thanks for sharing. These little coffin treat holders are awesome! I love the scroll on the top with the sentiment stamp on and I love the fabulous papers you used! These are great Amy! I want this cart now!!! Love all the details! YOu have been busy! Great job! spooktacular and adorable! is that even possible! yes with you it is!!!! Love the paper colors you used. So Halloween! Love this idea. The patterned paper looks great for this. Wow, absolutely love these!! Love the papers and the scroll work. What a great project!!! I want that cart so bad! I also love the treats for my sweets set but you did a great job. Thanks for sharing. Love your coffin treat holders. Such talent! What a super cute treat holder! I love the pattern papers you used and that scroll sign is gorgeous! Fabulous project Amy! Love your coffin treat boxes. TFS. Those coffins are way too cute. Such cute coffins and you went and made 3. WOW! These are fabulous!!!! Awesome use of ribbon and truly a brilliant package idea! 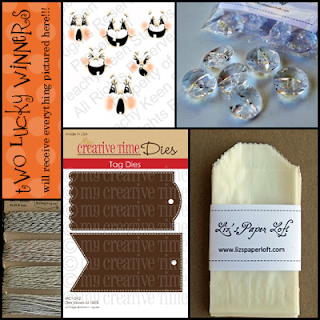 Thanks for playing along with the Ribbon Carousel Halloween Challenge!